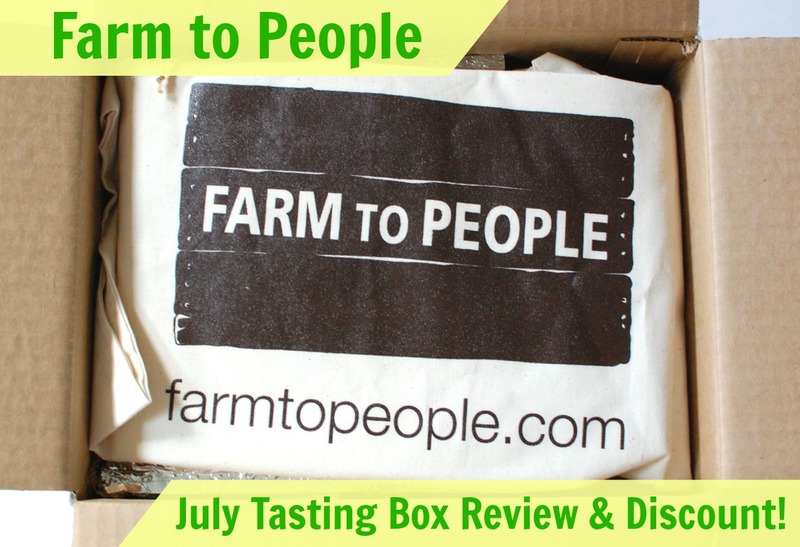 Farm to People Tasting Box July 2014 Review & 25% Discount Code! Farm to People in an online shop that offers a nice selection of small batch food, body care, accessories, and more. 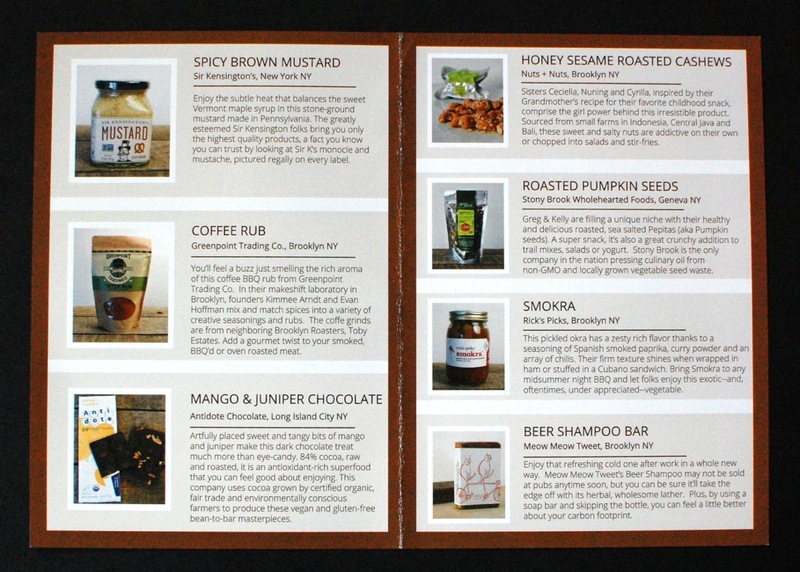 Their mission is to make it easy for everyone to discover and enjoy small batch artisanal goods. In addition to being locally crafted in small batches, all of the items sold on their site must also be non-GMO, humanely raised, and contain no artificial ingredients. Their high standards ensure that you’ll be getting the best possible products from some of the most ethical companies out there. 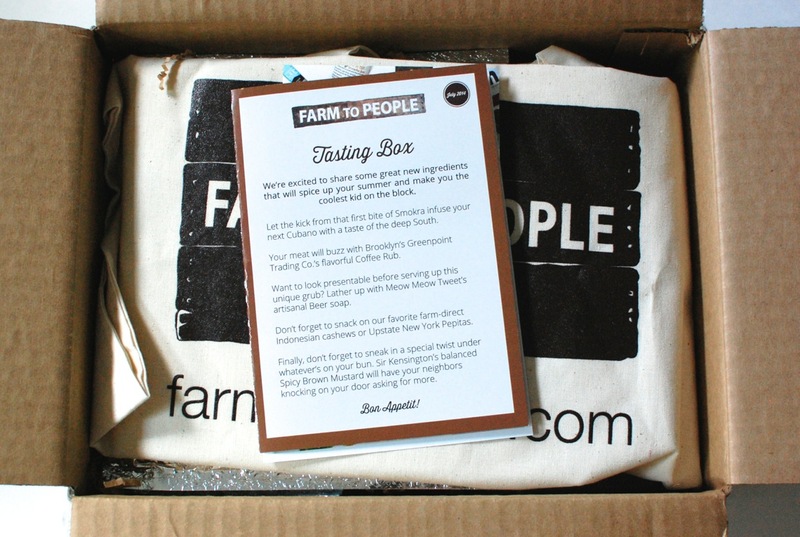 Farm to People recently launched a monthly subscription box that gives you a chance to sample a variety of awesome small batch products in one big curated box of yum. Each shipment will contain 5 to 8 “indie goodies” ranging from sweets, to condiments, to body care and everything in between. Subscriptions are $49.95/month and include free shipping. You can pause your shipments whenever you need to and they’ll even accommodate those who have allergies/dietary restrictions (yay!). I recently received July’s Tasting Box and was excited to see what was inside. Let’s check it out! First look. Everything was packed into a good sized box with their logo stamped on each side. It was also pretty heavy. In subscription box land (where I just so happen to live), heavy = good. They have a great info card/booklet that includes photos and descriptions of each product (which is kinda the whole point of info cards… so… not sure why I felt the need to spell it out.) But yeah, cool info card folks. 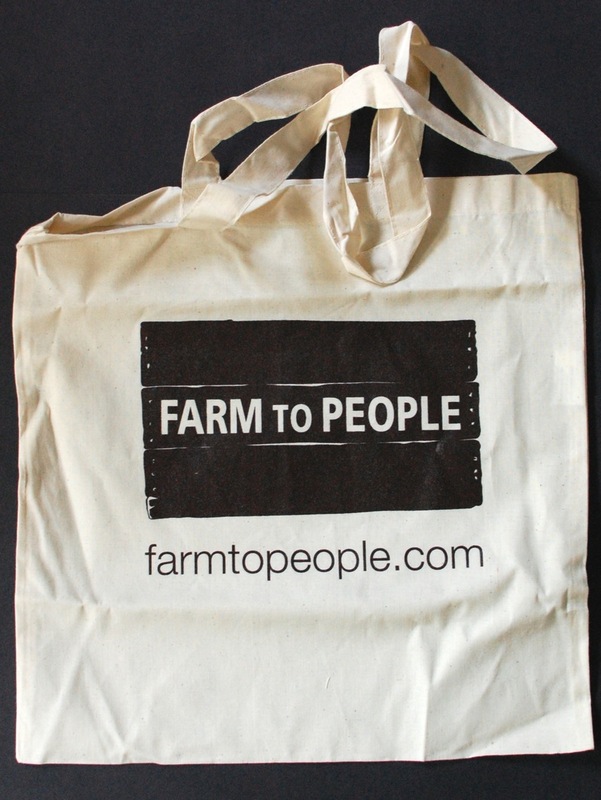 Farm to Table Tote – I believe this is just a fun “bonus” item, since it’s not on the info card. Yay for bonus items! Meow Meow Tweet Beer Shampoo Bar Soap – I’m so NOT a cat person, but drawings of cats perched atop tandem bikes… Now that I’m down with. Beneath this whimsical package lies a shampoo bar made with saponified olive & coconut oil, jojoba, hempseed, beer, and other natural (and mostly organic) ingredients. It’s intended to use on your hair, but is also a-ok for use on your whole body as well if shampooing with a bar ain’t yo’ thang. Handmade in Brooklyn, NY. Nuts + Nuts Honey Sesame Roasted Cashews – These are slow-roasted Indonesian cashews drizzled with honey and sprinkled with sesame seeds. I know I mention this a lot, but I just like to make it clear… As a vegan, I’m pretty lax about honey. I don’t go out of my way to buy it, but if something comes my way and is vegan except for honey, I’ll eat it. Okay, moving on… I tried these nuts earlier today and they are GOOD. They taste super fresh and have just the right amount of sweetness. Yum! Sir Kensington’s Spicy Brown Mustard – I just noticed that the ingredients on the Farm to People site lists egg yolks in this, which grossed me out because I swore it was vegan. So I checked the label and yep, there’s a big ol’ vegan symbol on it. So I’m guessing it was just an error on the site (hear that guys?). (Update: They fixed it! No more egg yolks!) Anywhooo… This is a spicy brown mustard made with real Vermont maple syrup and “#1 grade” mustard seeds. I’ve never really been one to use mustard on my sandwiches, but I’m thinking this would be pretty great to dip pretzels in. Antidote Chocolate Mango & Juniper Dark Chocolate Bar – Well this sounds interesting… A chocolate bar made with 84% raw & roasted cacao and bits of mango & juniper berries. The cacao beans are from certified organic, fair trade Ecuadorian farms and provide healthy antioxidants to make your sweets cravings a little less guilt-ridden. This bar is both vegan & gluten-free. Woo! Stony Brook Wholehearted Foods Roasted Pumpkin Seeds – These are non-GMO pumpkin seeds (or “pepitas“) made/grown in the Finger Lakes region of New York. The seeds are harvested by hand, then brined and roasted for a satisfying flavor and crispy crunch. Greenpoint Trading Co. Coffee Rub – This is an all purpose rub for BBQ-ing, smoking, roasting and baking. It’s made with a variety of spices and locally roasted coffee straight outta Brooklyn. 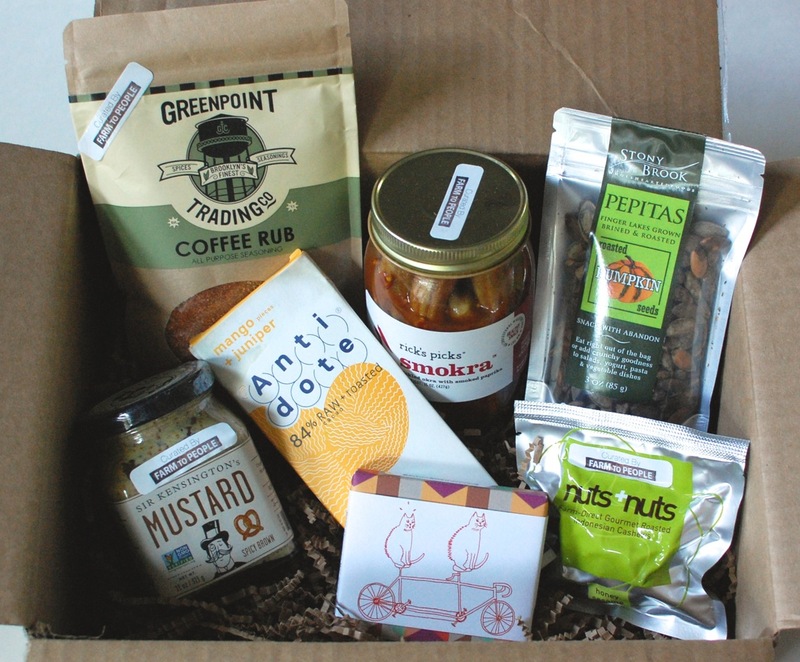 The July Farm to People Tasting Box was a great introduction to the small batch goodies offered on their site. I loved that everything in it just happened to be vegan (well, minus the nuts). I also like that there was a nice mix of different types of products. Food can get boring (wait — can it? ), so it’s always nice to see fun soaps and other personal/household type items. Disclosure: I received this box for review purposes. I was not compensated in any way. All opinions are my own. Post may contain affiliate links. I loved my box from them! I can’t wait to use the soap… I love getting indie soap and candles in boxes. The rub is really delicious… the okra is spicy, so beware! I wasn’t a fan of the pumpkin seeds, and the chocolate was too bitter to eat. The mustard IS wonderful with pretzels! Great packaging, great box!! I love indie soaps & candles too! I’m thinking they’ll definitely do a candle at some point. Now I’m *really* scared to try the okra (why couldn’t they just have been pickles!? haha). 😉 Definitely a fun box! I’m sold! Been trying Farm To People’s products and can’t get enough of them individually ~ especially the nuts (they come in different flavors, too!) and ALL their chocolate bars. Soaps and shampoos are another favorite. Pastas, pasta sauces and incredible Hickory Nut Gap salamis and pepperonis (for those non-vegans out there). And my dog loves the Ostrich Pet Treats. Guess it’s time to sign up for a subscription!